Threading or beading is a useful and fun activity for children. It promotes different areas of development such as fine motor skills, hand-eye coordination and early cognitive/math skills. Threading can be done with different materials such as strings, shoelace, wires, etc. Beads can be almost anything, limited only by your imagination. Unfortunately Alex has very little interest in doing threading. I kept on trying to introduce threading in many different forms. Today, I had an idea of encouraging threading using Cloudbabies as a theme. 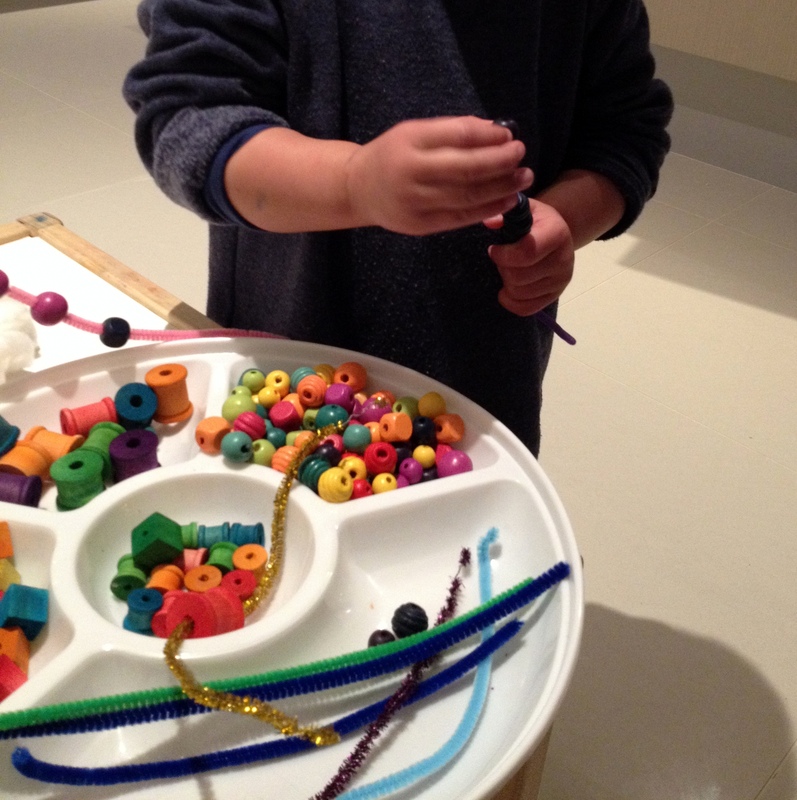 Using pipe cleaners and various beads, the aim is to make a rainbow just like in the TV series. Recommended for children age 18 months and over. Alex surprisingly was eager to thread not only one or two beads but almost the whole length of one pipe cleaner. It was also surprising to see how persistent he is to thread those beads. Although he didn’t finish the whole 7 colours of the rainbows but for me it was really meaningful to see his persistence, patient and moreover, his proud face when he was able to finish threading one string of pipe cleaner. So don’t worry if you’re children aren’t picking up certain activity immediately. Each child is different. They will do it in their own time. Glue the cotton balls around the outside of the Styrofoam to represent cloud. Print off Cloudbabies Characters from the internet, laminate it and stick it onto popsicles sticks. Provide different colours of beads, pipe cleaners and Cloudbabies Characters on the tables. 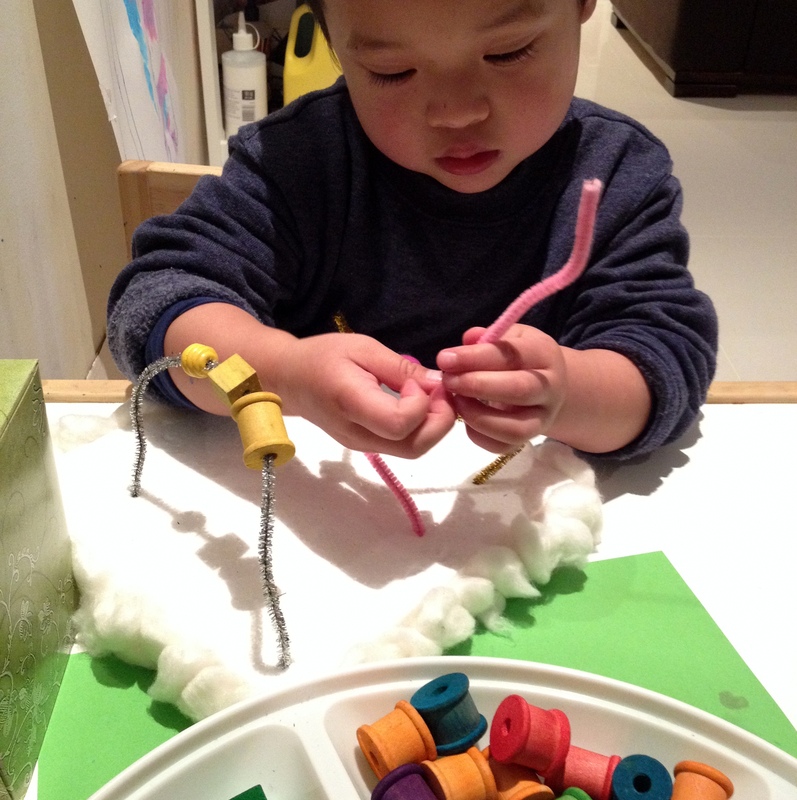 Show it to your child to thread the beads onto the pipe cleaner and poke it onto the Styrofoam to make an arch shape. Let your child explore the rest of the rainbow. Posted in Motor SkillsTagged arts and crafts, book based activities, colours, creative kids play, Early Childhood, early childhood education, fine motor, imagination, montessori, toddler activities, toddler playBookmark the permalink.